Staff Sergeant Bernard Moritz celebrated his 100th birthday this past April. As we talked about his life and the things that are important to him, Bernard described his life as anything but remarkable. But when you hear the many unique things he’s had the chance to do, I think you’ll conclude as I did that he’s had an amazing life’s journey. Bernard was born into a musical family and raised in Michigan City, Indiana, about 25 miles from the steel mills of Gary, Indiana. A brilliant young man, growing up he never received anything below an “A” in school, a feat made all the more remarkable in that Bernard stuttered severely. So severely, in fact, that his teachers never called on him because they knew he couldn’t speak without stuttering. When it came time for graduation, his graduating class did not have a Valedictorian because they knew Bernard would not be able to give the traditional address at the graduation ceremony. Although others might have dismissed him, Bernard did not let his stuttering slow him down. 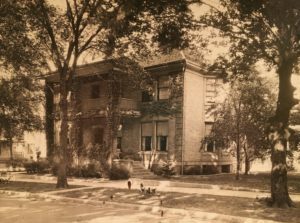 He was accepted into the prestigious University of Chicago in 1934, where he earned his bachelor’s degree and then continued studying law. That’s where he came to the turning point in his life. In order to complete law school, he had to participate in the school’s moot court competition. In moot court, law students argue a fictitious case in front of a panel of distinguished faculty and guest judges and are graded on their performance. On the night before the competition, Bernard had no idea how he would be able to present his argument to the court given his stuttering. Then the revelation came to him. Growing up, Bernard loved to sing. Now, for the first time, he realized that when he sang, he didn’t stutter. So the next day when he presented his argument before the judges, he imagined that he was singing it to music as if it were a Gregorian chant. Not only did this allow him to present his argument without stuttering, but he also never stuttered again! In fact, his presentation was so flawless that one of the visiting judges asked him where he had learned to articulate his speech so well. 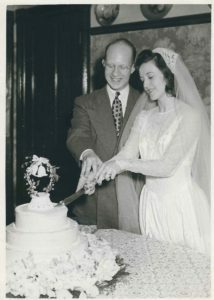 Bernard graduated from the University of Chicago law school in 1940 and began to work for a law firm in Chicago, Illinois. There, he and two other attorneys wrote and published a book on military procurement. He sent the book to what was then Wright Field in Dayton, Ohio, where the Army’s Materiel Division was located. He was asked to provide a 9 X 12 photo and to answer some questions, which he did. He expected that would lead to a commission in the Army, but he did not hear from them again. He later changed jobs and worked for the Municipal Reference Bureau in Minneapolis, Minnesota, providing legal advice to small towns. Then he was drafted. In February of 1942, Bernard reported to Fort Benjamin Harrison in Indianapolis, Indiana, for his basic training. Because he was the first lawyer that had been drafted in his region, they weren’t sure exactly what to do with him. Initially they thought he might be able to get a direct commission as an officer, but they learned that was only possible with the personal permission of the Secretary of War. Since Bernard didn’t personally know the Secretary of War, he went through basic training just like everyone else. After he had been at Fort Benjamin Harrison a few weeks, a group of non-commissioned officers (NCOs) approached him and told him that in order to be granted liberty and be permitted to go out in town, he had to have a proper garrison cap (uniform hat) and belt. They told him they would get it for him, but it would cost him $5. Bernard paid the money, but he never received his garrison cap and belt. He mentioned it to a Chaplain after choir practice one day and the Chaplain said he would look into it. The next day when Bernard was marching with his company, he heard his named called over the loudspeaker and was told to report immediately to the Captain’s office. 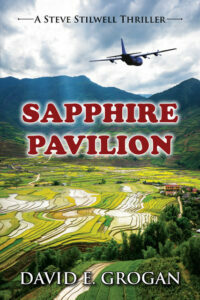 When he arrived, the Captain was there with the NCOs who took his $5. The Captain asked Bernard and the NCOs some questions, and then Bernard was dismissed and he went back to his barracks. Over the course of the next three days, Bernard was given continuous KP and guard duty, peeling potatoes and carrots and handling a rifle for the first time since he reported to camp. He didn’t get any sleep for three days. Apparently the NCOs didn’t take kindly to having their scheme disclosed, after they’d bilked thousands of dollars out of the many recruits who had trusted them with their money. In the end, they got what they had coming to them, in that all the NCOs involved were court-martialed. Bernard, on the other hand, went to work in the base commander’s office. Because Bernard could sing, he was given the opportunity to perform in a musical show written by some of the base officers’ wives. He traveled with the show throughout the 8th Service Command’s region, which included the Midwest and Texas. When he returned, he was given orders to Panama, where the U.S. had significant forces deployed to protect the Panama Canal. Once there, Bernard applied for a transfer to Military Intelligence. Bernard’s first assignment was to buy a civilian suit and pick up a Plymouth car because he would be doing undercover counter-intelligence work. He thought this typical military because everyone knew that U.S. undercover personnel drove Plymouths, so he doubted whether anyone was really undercover. 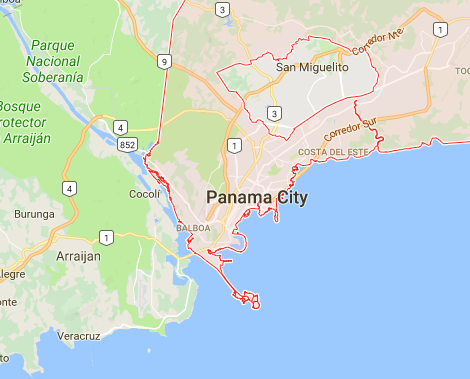 Still, he spent the rest of the war in Panama surveilling and reporting on people assigned to the Spanish embassy, and on agents the Spanish government hired (primarily South American women) to collect information from U.S. servicemen in Panama. Given that then-fascist Spain was sympathetic to Nazi Germany, the Spanish agents sent money and information to countries like Brazil, where there was a Nazi presence. Near the end of the war, Bernard was in a local club playing bridge when a group of officers came in and sat down. Bernard noticed one of them staring at him, so he went over to the officer and asked him if they had met before. The officer said in a manner of speaking, yes. 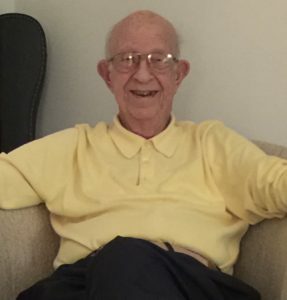 He said he had been assigned to a board at Wright Field before the war evaluating candidates for commissions as officers when he saw a 9 X 12 picture of Bernard and a description about how Bernard had helped write a book on military procurement. The board was deciding whether to offer Bernard a commission as a 2nd Lieutenant or a Captain when it learned Bernard had been drafted and inducted into the Army. At that point, they stopped considering Bernard as a candidate for a commission as an officer. Bernard was discharged from the Army in September 1945. He went to work in the Office of the Alien Property Custodian, where he located people who had had their property confiscated by the Nazis and returned it to them once it fell into American hands. His cases involved all kinds of assets, including jewelry, artwork, real estate, and ownership interests in companies. Bernard did this until 1949, when he went to work in the General Counsel’s Office for the newly formed National Aeronautics and Space Administration, better known as NASA. Bernard had a long and distinguished career with NASA. When he started, the agency was brand new. He had no office, no instructions on what to do, and no regulations constraining the agency’s actions. By the time he finished, not only had he reviewed billions of dollars of contracts with major aerospace companies, but he also went on to rise to the level of Deputy Administrator. He worked on issues supporting the moon landings and the space shuttle flights, and in 1971, was awarded NASA’s highest honor, the Distinguished Service Medal. He retired in 1975 and moved with his wife to Williamsburg, Virginia, where he lives to this day. In looking back on his military service, Bernard feels it was a worthwhile experience, and he would recommend the military to young people today. He believes service in the military teaches people how to get along, how to organize, and how to lead. Bernard also wanted to stress how important music was in his life. It helped him at almost every milestone, but most importantly, it helped him overcome his stuttering. 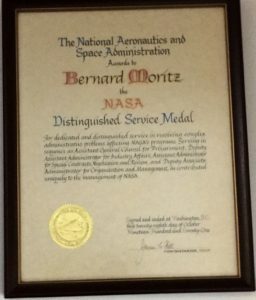 Voices To Veterans is proud to salute Staff Sergeant Bernard Moritz for his long and distinguished career of service to the United States during World War II and for many years thereafter at NASA.